If ever there was a good use for Locktite, that would be it. Good idea, I'll put that on the list for later this fall when I'm done driving the car. Don't worry, I still have it. I spent most of summer getting ready for a secondary storage unit on my property. The SVO finally has a permanent inside storage spot since October. It feels nice to have it tucked away where it can stay clean, dry and (hopefully) rodent free! 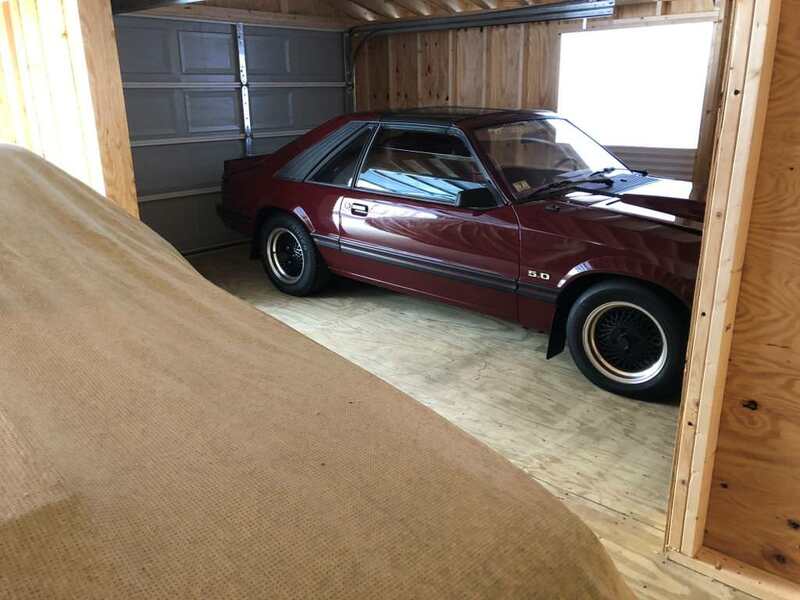 And here is a pic of the SVO's stable mate, my 82 GT T-Top car that I've done a resto / mod on over the last 10 years or so. NICE-- when you showing up here for a 'barn raising' ? Just noticed, it's a wood floor... interesting... concrete is one of the big reasons I can't build one where I currently live. Eric, technically it's a shed and not a garage. Built to order and delivered in 2 pieces via trailer. 24' wide x 20' deep. The flooring system starts with PT 4x4's that run the depth of the garage (front to back). Then there are 2x4's 8" on center that run perpendicular. Then PT plywood as the final step. It's sitting on a base 4-6" deep of crush stone for drainage. 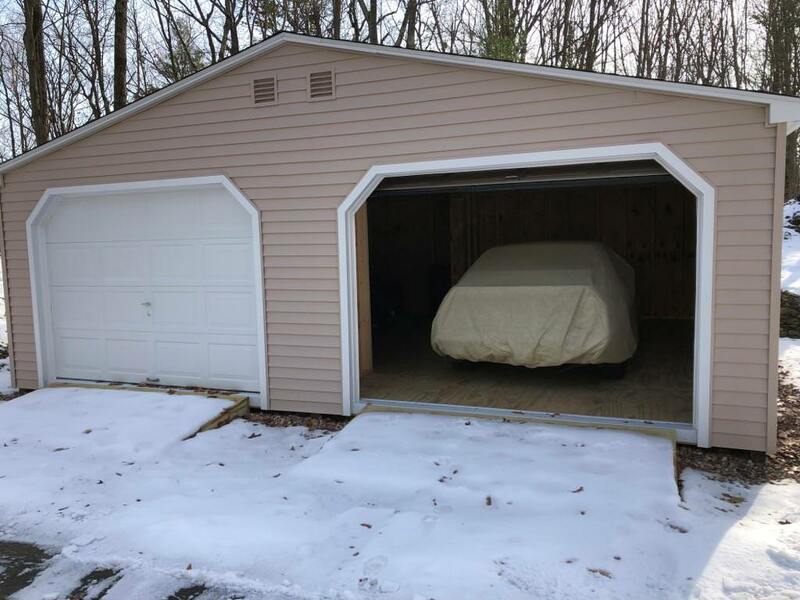 I too noticed the wood flooring, so it is a 'non-permanent' car shed...very clever! Congrats getting both of those Fox gems into a 4-walled dwelling. <SNIP> It feels nice to have it tucked away where it can stay clean, dry and (hopefully) rodent free! Thanks Gene, over the years I've tried all the normal "mouse repellents" including dryer sheets, Irish spring soap, etc. None worked - and this was one of the main reasons I sold my 86 GT Vert (which was stored off-premise during winters and always had mouse damage come spring). Sounds like you need some cats for the property Bugs/spiders are 'easy' to discourage, original scent Downy softener sheets always seem to work for me. Luckily I haven't had any rodent related issues, even the few years I off-site stored my vehicles in barns. I do know that steel wool in the tail pipes and intake track with discourage mice, we used that to stuff holes that they chewed through foundation concrete and holes in walls/stud plates. Apparently they don't like the taste of the steel. I hear you on that! We had rodents take up raising their pups in the hood insulation of one of our Cadillacs. Unfortunately, mama mouse got a hold of some of the bait and didn't make it back to the pups. That hood insulation had to go. I replaced it with some aftermarket insulation. It's okay, but even the 50-year old original looked better. We had another family grab some insulation off the hood liner of our 3800-mile Dakota R/T. Luckily, just some chewing of part of the pad closest to the hood itself, so it's mostly-hidden. The SVO has a 'glass hood and no liner, but even it's hood is up. All hoods are up in our shop, even if the car has a cover. Kind of defeats the use of the cover but at least it keeps the dust off the rest of the car. I've found that rodent protection requires a multi-pronged strategy. Keep them out, if you can, keep them out of the cars if you can, and poison them if you have to. We're in a semi-rural area, so there are bobcats, foxes, coyotes, and the occasional barn cat, yet we still see signs of rodents in the shop. The little effers can get EVERYWHERE, too. We have shelving like you see in the big box hardware stores, and I've seen rodent droppings on the top shelves on those things.